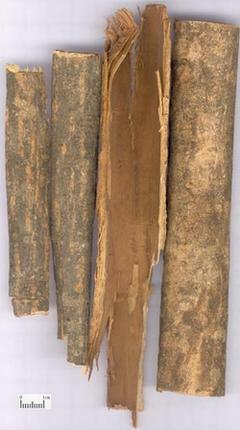 The twig skin or trunk bark of arbor plant of oleaceae-Fraxinus rhynchophylla Hance or F. chinensis Roxb. Mainly from Jilin, Liaoning and Hebei provinces in China. Long strip with thin, slick crust, hard texture, fabric cross section in white-yellowish color. Bitter and cold; large intestine, liver and gallbladder meridians entered. Clear heat and dry dampness, clear the liver to improve vision, clear heat and remove toxicity. This herb is bitter in flavor and cold in nature, mainly enters large intestine to clear heat and dry dampness and has actions of slightly clearing heat and removing toxicity. For the actions of clearing heat and removing toxicity is not that strong, it is usually used as an assistant herb for herbs good at clearing heat and drying dampness and herbs good at removing toxicity and checking dysentary. For instance, it is used for checking dysentery with difficulty in emptying bowels, purulent and bloody stool, tenesmus, combined with Bai Tou Weng, Huang Lian, Huang Bai, etc. , as in Bai Tou Weng Tang from Shang Han Lun. For treating leukorrhagia due to damp-heat, it is often combined with dampness-dispelling and relieving leukorrhagia herbs such as Huang Bai and Ku Shen, which can be taken internally or applied externally. It can also be used for treating metrorrhagia, leucorrhea with reddish discharge. For instance, it is combined with Mu Dan Pi, Dang Gui in Ben Cao Hui Yan. Being able to enter liver to clear liver heat, it is either taken internally or applied externally for treating bloodshot eyes with pain, nebula due to liver fire flaming up. When taking orally, it is often combined with other liver-clearing and vision-improving herbs. 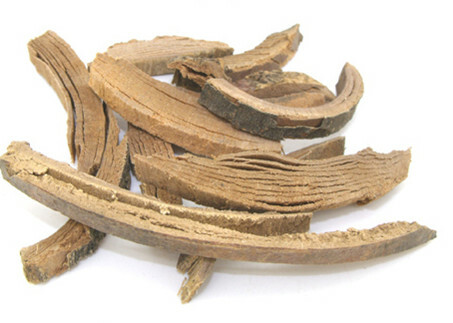 For instance, combined with Jing Jie, Zhi Zi and Chi Shao in Qing Pi San from Yong Lei Ling Fang (Sealed by Yong Lei Prescription), it is used to treat sudden bloodshot eyes with pain due to liver heat and wind heat, the decoction or the juice extraction can be used to wash eves or as eye drops. For instance, its juice extraction was used as eye drops to treat bloodshot eyes and eye sores recorded in Jin Xiao Fang (Prescription of Approaching Good Effect). In addition, this herb can clear lung heat, relieve dyspnea and dispel wind-damp. The modern research showed that it can be used to treat cough and wheezing with profuse sputum due to lung heat, downpour of damp-heat, red, swollen, hot and pain joints. Decoct 6~12g, and proper dose is for external application.